My neighbor came over the other day after cleaning out his garage and asked if the kids wanted a Gaucho Rockin’ Electric car. Of course they did. One small problem however. The gear-shift didn’t work, the build quality was just not very good, and it needed a replacement. 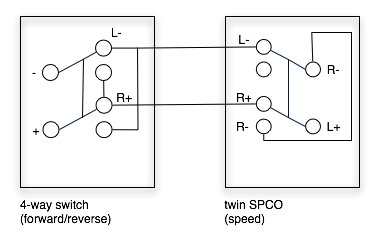 switch between having the 2 engines coupled in parallel or in series to allow for 2 seperate speeds. switch the polarity to allow for reverse gear. 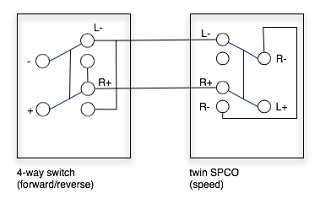 The first part could be handled by a twin SPCO* (nor: dobbel endevender**), the latter by a four-way switch* (nor: kryssvender**). These are the kind of switches you normally use to have a set of switches control a single light-source (the SPCO are at the end of the wiring, the 4-way-switches are between them). Luckily these were both stock parts at my local DIY-store, Clas Ohlson***, so I went rigth their way and bought one of each. 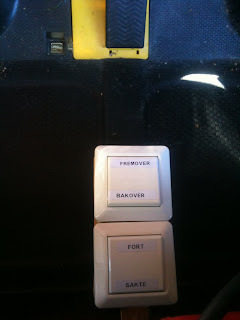 I screwed the switches to a small piece of plywood, which I mounted were the original gear-shift was mounted. The original shift didn’t allow for high-speed while dringing in reverse, however the modified version does. I don’t have any problem however seing that this might not be such a good idea :-). If you have any ideas on how this could have been done otherwise, don’t hesitate to make a comment of it.